And the snake eats its own taco-flavored tail. 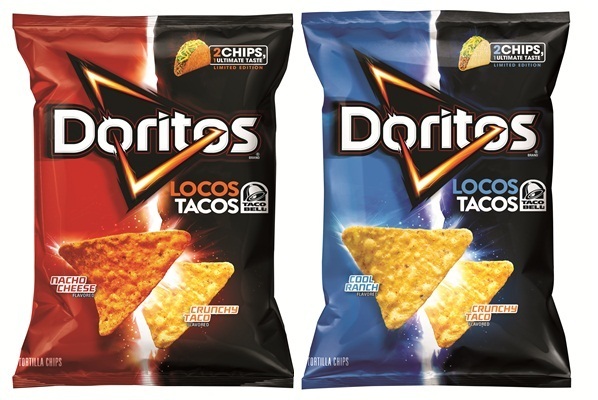 It was an inevitability we all secretly knew but refused to openly admit for fear of having to face the inherent existential dilemma it presents, but the fearless folks at Pepsico have decided to mess with the snack-time continuum, announcing the impending release of Doritos Locos Tacos flavored Doritos. So the corn chips that became the basis of a wildly popular Taco Bell treat will soon be released as a corn chip pairing (there are apparently two types of Dorito in each bag; one taco-flavored and one being a standard Dorito) that supposedly mimics the flavor of the Taco Bell snack. The new chips will also be available in the Cool Ranch version of the Doritos Locos Taco, which for some reason seems even more bizarre. Perhaps we’re still in shock. This is as good a time as any to announce that I’m selling the screen rights to my upcoming novelization of the movie version of the Producers, which was based on the Broadway show, based on the original Mel Brooks movie, which was itself based upon a travel pamphlet Mel Brooks read while waiting to catch a train to Schenectady… or so we’ve heard.